When an expansion of the underground caverns of the gnome tribe Riven inadvertently releases a legion of evil spirits, known as the Demons of the Blood, from their ancient, sub-terrainian prison, the shaman Xersek must seek the aid of another gnome tribe in putting the unholy monsters back where they belong. Xersek recruits the aid of his old friend Malík, the shaman of Tribe Qadash, as well as the renowned but grim warrior Scarro Jinto and his light-hearted apprentice Ronan Kah. 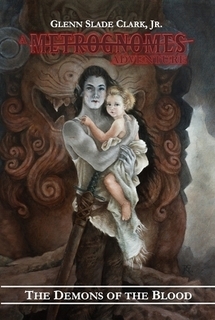 As the four heroes set out on their quest, the Demons of the Blood have already taken possession of the king of Tribe Riven and are holding his grandson, Prince Lumino, prisoner, demanding the surrender of the tribe's temporary leader in exchange for the child's release. Seeing this as an obvious trap, Xersek leads his small band into the heart of the long abandoned Caverns of the Lost Tribe and a showdown with the multitude of reanimated gnome corpses and victims from Tribe Riven who have been taken over by the demon chiefs and their army of bloodthirsty spirits. There are many more "demons of the blood" than the immortal devils they face in the caverns. And where swords and magical staves may fail, only a hero's heart will prevail.